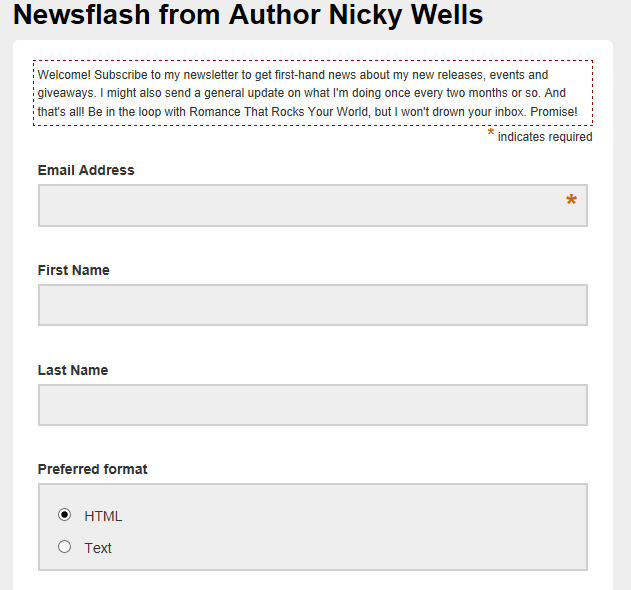 The New Nicky Wells Newsletter! Sign up today! You can sign up right at the Top Right Hand Corner of my blog, just click on the small image and it’ll take you through to the form. Now why would you subscribe to a newsletter if you’re already following my blog? Good question! Occasional personal updates just… well, just for the fun of it. This entry was posted in Miscellaneous and tagged Newsletter. Bookmark the permalink. How did I miss this post.. It doesn’t matter, I’m signed up now. YAY! Thanks for signing up, Robin, I’m thrilled to have you onboard. No, you haven’t missed any issues yet. I’m determined not to spam anyone, so I’ll write news when there are news. Watch this space!